Two researchers who developed an after-school psychology club for primary-school children have told us about their project, and shared their suggestions of what works when engaging with a much younger audience. Experimental Officer Dr Susanna Martin and Eleanna Skoulikari, from the University of Bath’s CREATE Lab, also crowd-sourced some of their ideas for sessions through The Psychologist. The CREATE Lab was contacted by a local primary school to develop an after-school psychology club and recruited postgraduate students from the Psychology Department to help. Each session was supervised by Skoulikari, and the PhD students used their own research to come up with topics for each session along with complementary activities. Each of the Psychology Club’s weekly meetings involved a short presentation by one or a pair of postgraduate researchers, followed by hands-on activities along a similar theme. For example, after the first week’s session pupils were asked to keep a dream diary, and the following week they had a go at dream analysis. They also explored robots (and built their own), video games, optical illusions, emotions and stress. 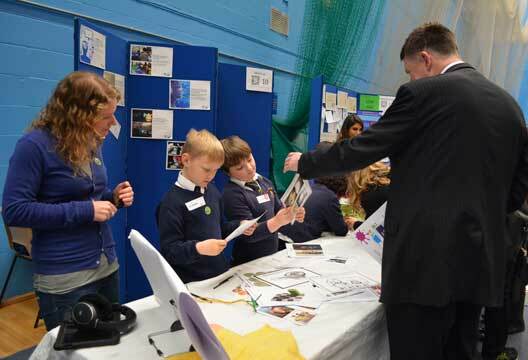 In their ninth session, the pupils divided into groups and chose activities they had learned to present to members of the public at the local Bath Taps into Science festival the following week. Skoulikari said it was amazing seeing the pupils’ confidence grow, and their learning was very apparent when they were presenting activities to members of the public in a ‘teacher’ role. The second term of Psychology Club also involved physics PhD students as guest presenters leading sessions on light and forces. At the end of each session pupils were asked to write positive and negative comments as feedback, Martin and Skoulikari said all the students had enjoyed the sessions and were disappointed to hear it would not be continuing due to a lack of funding. However, they offered some tips for any other researchers interested in running a similar club. Martin said prior to embarking on a project like this it was vital to plan early, especially with regard to DBS checks for those working with children for longer stretches of time and building a good relationship with the school. Skoulikari added that it was vital to be well prepared with equipment and resources, prepare hands-on sessions and back-up activities in case they take less time than anticipated, and use informal techniques to gather feedback from pupils. - To read our original article crowd-sourcing ideas for Martin and Skoulikari’s sessions see tinyurl.com/ybt5tyg4. If you started a ‘Psychology Club’ after reading that, let us know how it went.